Portland, Oregon. Earth. 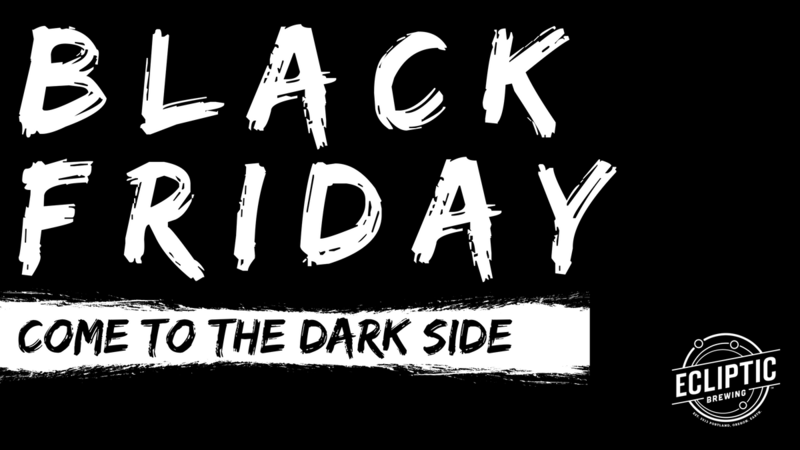 (November 16)– On Friday November 24th, Ecliptic Brewing invites you to escape the Black Friday madness in the stores and come to the dark side at their brewery and restaurant in North Portland. Dark beers celebrated with a 6-beer taster tray featuring some brews from their cellar, including the 2014 Bourbon Barrel-Aged Coalsack Cascadian Dark Ale. A Black Friday beer cocktail crafted with their award-winning Capella Porter, Aztec Chocolate Bitters, and more. A delicious dark side special from Chef Michael Molitor and Team; squid ink spaghetti with manila clams, garlic, and chilies. 10% when you buy 6 or more bottles to-go. Where: Ecliptic Brewing, 825 North Cook Street, Portland, Oregon. Earth. Check out the Facebook page here for all of the up to date details. Ecliptic Brewing is a venture from John Harris, an Oregon beer icon whose background is steeped in the state’s rich craft brewing history. The name Ecliptic unites Harris’ two passions: brewing and astronomy, and as such, the brewery celebrates the Earth’s yearly journey around the sun through both its beer and restaurant menus. Executive chef Michael Molitor rotates his seasonally inspired menu every six weeks in accordance with the old-world calendar. Harris’ signature beers include Spectra Hoppy Pilsner, Orbiter IPA, Carina Peach Sour Ale, and Capella Porter. For more information, visit:www.eclipticbrewing.com.